Editor’s Note: I’ve decided to begin posting my reviews of films screening at SXSW early, hope­fully helping anyone attending make some decisions about what to see. 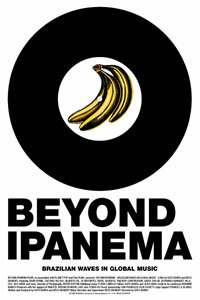 Beyond Ipanema is screening on Thursday March 18 at 9:30pm at the Alamo Ritz 1. Beyond Ipanema (Director: Guto Barra): Early on in this documentary about Brazilian music, David Byrne points out that unlike many other countries, Brazil’s principal export has been culture, especially music. The film patiently traces the influence of Brazilian music on North American culture beginning with Carmen Miranda’s first performance in New York City in 1939. Miranda’s string of films throughout the 1940s were immensely popular, and she always insisted on singing a few songs and saying a few lines of dialogue in Brazilian Portuguese. In the late 1950s and early 1960s, American jazz music was influenced by the sounds of bossanova, and a collaboration between Joao Gilberto and Stan Getz led to a huge hit song, “The Girl from Ipanema,” sung by Joao’s wife Astrud. Sergio Mendes and his band Brasil ’66 were also hugely popular in North America during the ’60s. Brazilian influence was dormant for nearly the next two decades until David Byrne’s Luaka Bop record label began releasing (or in many cases re-releasing) Brazilian artists in North America again, in the late ’80s. Since that time, the influence has gone in both directions, with many artists utilizing “mashup” methods to incorporate different elements into their music. As many of the Brazilian commentators note, Brazil has a long history of ingesting outside influences and making them Brazilian, so the birth of DJ culture has been welcomed with open arms. Unfortunately, the last 15 minutes of the film were unplayable on the screener I received, so my review will not be entirely complete, but my largest criticism of the film to that point is that there just wasn’t enough actual music. This was more of a problem with the classic artists of the ’50s and ’60s, and is likely the result of expensive licensing issues, but it detracts in a major way from the film. If any music documentary deserves more than talking heads, even ones as famous as Byrne, Devendra Banhart, and Gilberto Gil, it’s one about a musical culture as vibrant and alive as Brazil’s. Though I was able to note a few bands worth following up (CSS, Garotas Suecas, and almost-forgotten psychedelic pioneers Os Mutantes), I would have loved to see and hear more performances and fewer talking heads (and Talking Heads). This entry was posted in Documentaries, Film Festivals, SXSW and tagged #sxsw10, brazil, music. Bookmark the permalink.